Can You Eat Quinoa If You're Gluten-Free? Pure quinoa is gluten-free, making it safe for people with celiac disease and non-celiac gluten sensitivity. However, that doesn't mean that all products containing quinoa are gluten-free. In fact, some products with quinoa as an ingredient also contain gluten grains. You need to be careful and read product labels. Quinoa often is touted as a super-healthy substitute for gluten-containing grains. It increasingly appears on restaurant menus and in processed food mixes you find in the health food section of your favorite grocery store. Quinoa isn't really a grain. It's the seed of a plant that's related to spinach, not to wheat. Quinoa first was cultivated in South America, where it grows in the Andes mountain range. Quinoa grows best in cool climates and at high altitudes, generally above 8,000 feet. Even though we don't normally eat spinach seeds (we eat the leaves instead), quinoa is grown for its edible seeds. If you can find plain quinoa—whole or flour—that's labeled gluten-free or certified gluten-free, it makes a perfect substitute for grain-based menu items. Several popular brands of plain whole-grain quinoa are labeled "gluten-free," including Ancient Harvest, Trader Joe's, and Bob's Red Mill. A study published in The American Journal of Gastroenterology confirms that quinoa is safe for people who have been diagnosed with celiac disease. Researchers sought to prove or refute evidence from prior research indicating that quinoa might aggravate the immune system in people with celiac. To test this, 19 diagnosed celiacs who were following the gluten-free diet ate 50 grams of quinoa (a little less than a quarter of a cup) every day for six weeks. The researchers evaluated their diets, tracked their symptoms, and monitored their immune system reaction with celiac blood tests. They also looked directly at the small intestines of 10 people both before and after adding quinoa to their diets to see if they were experiencing villous atrophy (damage to their intestines). They actually found slight improvements in villous atrophy those who underwent the tests. The researchers also noted slight improvements in cholesterol measures. "Addition of quinoa to the gluten-free diet of celiac patients was well tolerated and did not exacerbate the condition," the study concluded. However, it added that longer-term studies will determine the ultimate safety of this grain substitute for those with celiac disease. There hasn't been any research confirming whether quinoa is safe for people with non-celiac gluten sensitivity. However, most experts believe that it is safe, since it's not closely related to the gluten grains (wheat, barley, and rye). Are All Products with Quinoa Gluten-Free? Although quinoa has become a popular gluten-free grain substitute, and its use in gluten-free products on the market is widespread, not all products that contain quinoa are gluten-free. In addition, not all dishes in restaurants that include quinoa are gluten-free, even if quinoa is the main ingredient in the dish. It's just like you can't assume products that contain rice or corn as their main ingredient are gluten-free. You always have to check the ingredient label for terms that mean gluten before buying anything, and talk to the chef about all the ingredients used prior to ordering anything. When shopping for quinoa products, it's best to stick with products that are specifically labeled "gluten-free." Ancient Harvest makes a variety of safe quinoa products, including pasta that's based on quinoa and corn flours and made in a gluten-free facility. Orgran, another manufacturer of gluten-free products, makes gluten-free cereal, flatbread, and multigrain crumbs with quinoa. Bob's Red Mill makes quinoa flour in a gluten-free facility. If you have celiac disease and cannot tolerate oats, you should know that Bob's also processes its gluten-free oats in that facility. However, Bob's Red Mill also makes an Organic 7-Grain Pancake Mix with quinoa which is not gluten-free. Remember: always check the label before buying a product that contains quinoa. 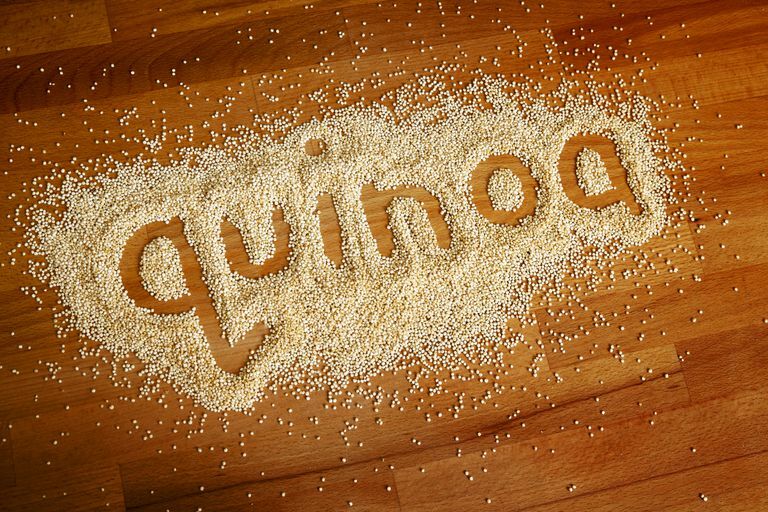 Whole quinoa can be used as whole-"grain" hot cereal—cook it as you would oatmeal—or as a base for cold cereal. It can also be ground into flour for flatbread or found in gluten-free flour blends for cakes and pastries. Quinoa also makes decent pasta. Some people like to use it in cold summer grain-based salads instead of bulgur wheat as well. Zavallos VF, et al. Gastrointestinal Effects of Eating Quinoa (Chenopodium quinoa Willd.) in Celiac Patients. The American Journal of Gastroenterology. 2014;109:270-278.